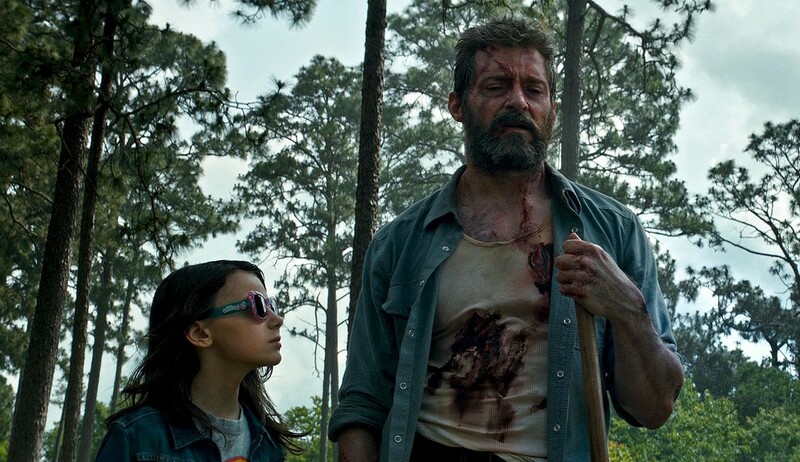 Dafne Keen and Hugh Jackman in "Logan." With "Logan," Hugh Jackman makes his (supposedly) final appearance as Logan, a k a Wolverine, a character he's played to perfection for 17 years and across nine "X-Men" films. The third solo outing for Wolverine, this sad, stirring film focuses on the humanity and emotion of its story, making "Logan" a gory and surprisingly affecting elegy for the franchise's most beloved character. The film picks up in 2029, a not-too-distant future where nearly all of mutant-kind has been wiped out. Logan has aged considerably since we last saw him: he's greying, his healing abilities are slower, and his eyesight is fading. Sometimes his claws don't snap out with a "snikt" the way they used to. More than anything, this is a man who just wants a place to rest his weary adamantium-plated bones. We soon learn that Logan is also caring for an ailing Professor Charles Xavier (Patrick Stewart). The Professor is battling dementia and dangerous seizures that, when affecting the most powerful brain on the planet, become a threat to the lives of anyone unlucky enough to be in the vicinity. The pair have shacked up with an albino mutant -- whose abilities allow him to easily track other mutants -- called Caliban (Stephen Merchant), who helps tend to Charles when Logan's away. Logan is working as a limo driver, hoping to raise enough money for he and Charles to leave everything behind for a life at sea. In their scenes together, Jackman and Stewart convey a lifetime of history -- both good and bad -- between the two men. But Logan's plans to walk off into the sunset are interrupted by a mysterious woman (Elizabeth Rodriguez) who's tracked him down to plead for help. She has with her a young girl, Laura (newcomer Dafne Keen making an indelible first impression), who demonstrates some remarkably familiar mutant abilities. The woman asks Logan to take Laura under his protection and shepherd the girl to North Dakota and onward to safety across the Canadian border -- the "save the last of a dying breed" mission gives off a bit of a "Children of Men" vibe. Once Logan reluctantly agrees, they're immediately pursued by Laura's creator, Dr. Rice (Richard E. Grant) and a militarized force led by a robot-handed mercenary (Boyd Holbrook), who think nothing of butchering anyone who stands in the way of reclaiming their property. "Logan" is uncharacteristically intimate and character-driven for a superhero film (at least the type that have become prevalent over the last several years), but I'm not going to pay it the backhanded compliment of saying it "transcends the material." Anyone who's ever read comics knows they come in all genres and tones. But for all its super-powered antics, "Logan" stays resolutely human-sized. The decidedly adult tone is set immediately, as the film opens with Logan dealing swiftly and gruesomely with a band of violent carjackers. The brutality is shocking (prepare yourself for an overabundance of skull stabbings, plus more eviscerations and impromptu amputations than you can shake a stick at). It's less juvenile than "Deadpool," last year's R-rated superhero blockbuster that gave studios the green light to give their comic book adaptations a bit more bite. This change taps into what made Wolverine's appearance in the previous "X-Men" movies feel so patently false. Wolverine's weapons are retractable blades meant to slice and dice. This is what he does. Not for nothing, but the character's victims have a lot in common with those of Freddy Krueger, and no one's expecting that guy's films to maintain a PG-13 rating. The violence depicted in "Logan" is wince-inducing, savage, and very bloody. The violence he inflicts actually has consequences, and that makes all the difference. Director James Mangold tosses in a number of references to the classic 1953 western "Shane." The connections to that film are more of a loose, thematic throughline than anything else. It's a story of a killer disillusioned with a life of killing, seeking a way to leave it behind but finding it impossible; there's no going back from all that death. All of the "X-Men" movies have a bit of a tragic air about them, centering the way they do around individuals who seek a place for themselves in a world that would rather see them destroyed. "Logan" presents a decaying vision of America: it's a country that's irreparably broken. There's no world-ending plot to foil, just a planet that's become a darker, more brutal place; one its characters can't fight, but can only hope to escape from. It's grim and almost unrelentingly bleak, though the many exciting, well-staged action sequences keep things from getting too morose. The film ends with a lovely final image, putting a nice period on its story of a man built to be a weapon, who managed to find his humanity in a world so harsh it left a bruise. Check back on Friday for additional film coverage, including a review of the documentary "Kedi."